The company that became Movado was founded in La Chaux-de-Fonds, Switzerland in 1881 by a 19-year old entrepreneur, Achille Ditisheim. In 1885 two of his brothers, Leopold and Isidore joined him and the name of the company became L. A. I. Ditisheim from a combination of their initials. It later became L. A. I. Ditisheim & Frère when another, unnamed, brother joined. 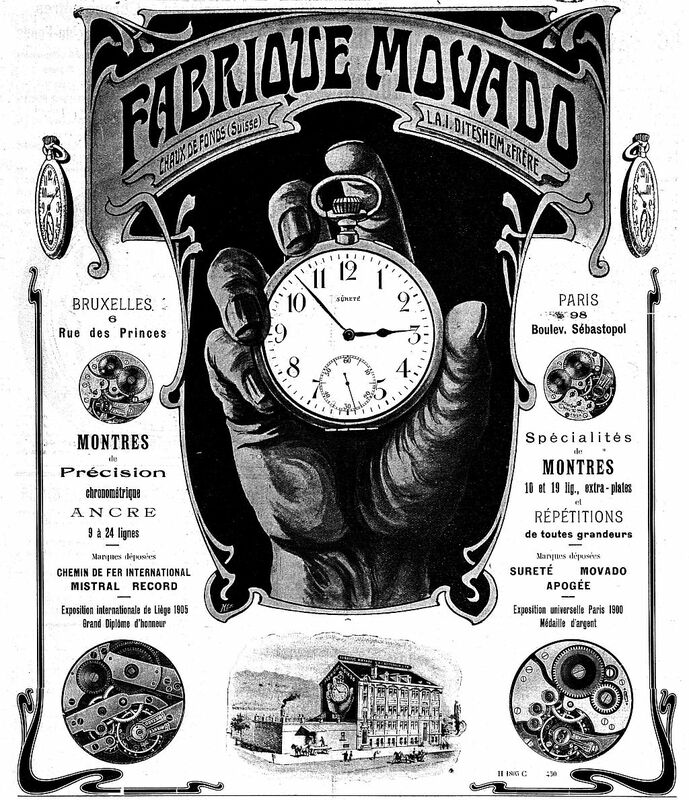 The advert reproduced here from a 1907 Swiss trade journal shows the name L. A. I. Ditisheim & Frère and a hand holding a watch, a trademark that appears in many Movado watch cases. The advert says that the company makes precision lever watch movements in sizes from 9 lignes to 24 lignes and specialises in 10 and 19 ligne extra thin movements, and repeaters of all sizes. Registered trade marks are given as "Chemin de Fer International", Mistral, Record, Sureté (safety), Movado, and Apogée. Movado registered many more trademarks over the years. In 1912 Movado created the Polyplan, a revolutionary, patented movement constructed on three planes to fit a case curved to follow the wrist. In 1914 Movado developed their "Soldier's Watch" with an integral protective grill or shrapnel guard in a shrewd anticipation of the forthcoming conflict. This was a very successful product for Movado, and it is believed that they sold some 2,000 each year during the First World War. One of Movado's best known watches is the iconic "Museum" watch, designed in 1947 by the American designer Nathan George Horwitt, who was influenced by the German Bauhaus art school. The Museum watch featured a completely plain dial with a single marker dot at 12 o'clock intended to suggest a sundial, the most ancient form of keeping time. One of these watches, made in 1947 by Vacheron & Constantin-Le Coultre, is part of the permanent collection of New York's Museum of Modern Art. Movado copied the design of the Museum watch in 1948 without permission and Horwitt sued, the case eventually being settled in 1975. In 1969 Movado joined with Zenith and Mondia to form Mondia-Zenith-Movado. Like every Swiss watch manufacturer, Movado suffered during the "quartz crisis" of the 1970s and in the 1980s became a dormant company, existing in name only. In 1983 Movado and Zenith separated and Movado was bought by the American Gerry Grinberg, who escaped the Communist revolution in Cuba. Today the Movado brand is part of a global group Movado Group, Inc. (MGI). "The year 1935 saw the introduction of the first Movado water-resistant wristwatch, the ‘Acvatic’. This unusual spelling of the word is derived from the Latin word ‘aqua’ (water) and was first registered as a trademark on 13th February 1936. Produced in various sizes the Acvatic had a screwed back with a lead gasket and a cork seal for the winding crown. It was developed by the case-making firm of François Borgel of Geneva, which was owned by three brothers called Tauber [sic]. 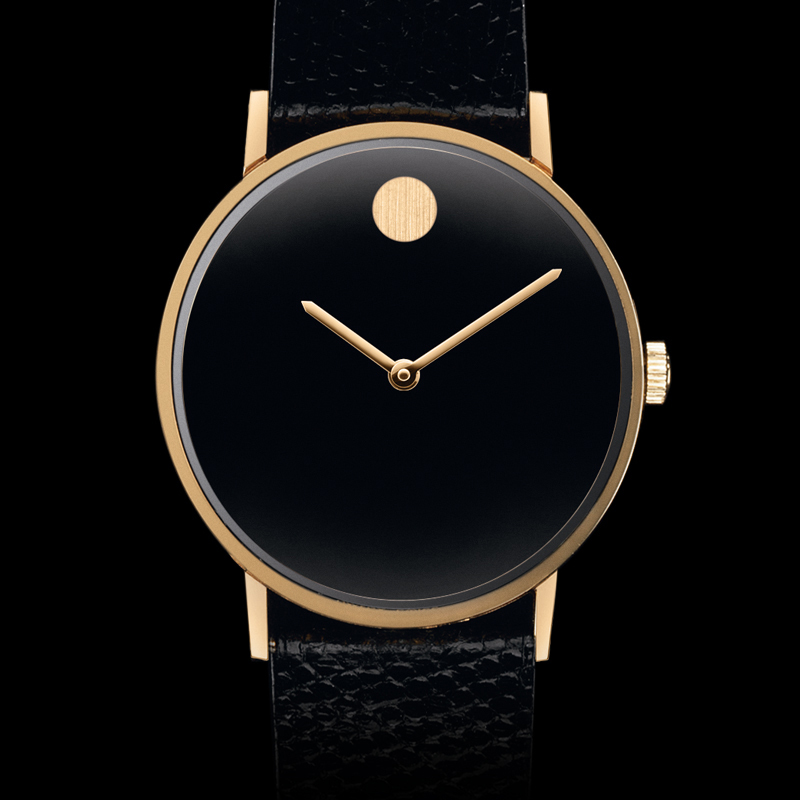 They developed many other variously shaped water-resistant cases for Movado during the subsequent decades. Later a two-button chronograph called "Cronacvatic" was developed." The screwed back case was of course the Decagonal back Taubert case, complete with cork seal for the winding stem. Von Osterhausen gives the year of introduction of the Acvatic as 1935, a year later than the waterproof models using the Decagonal case back introduced by Mido and West End. 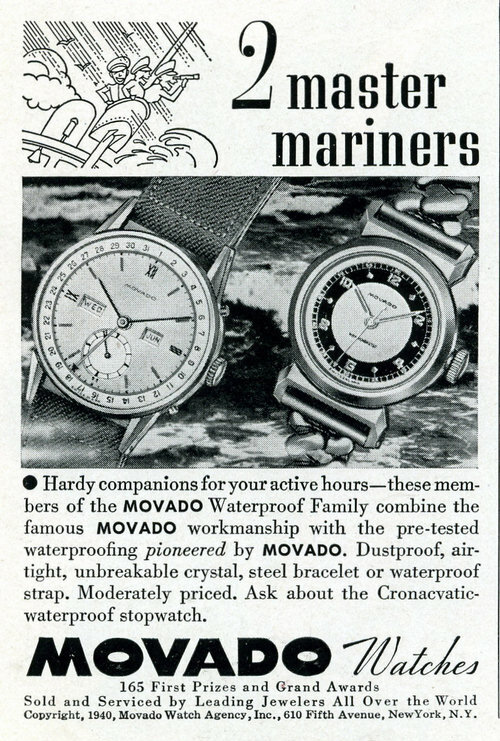 So the wording of the 1940 Movado advert shown here is a little misleading, because the wording in the advert says "with the pre-tested waterproofing pioneered by Movado". It also says "Dustproof, airtight, unbreakable crystal ..." - how advertising standards have changed since 1940! Movado became a big customer of the Taubert's and one sees many Movado watches from the 1930s to the 1960s in the distinctive Decagonal case, but unlike the Mido cases these are proudly stamped with the FB-key Borgel / Taubert trademark. Sometimes these marks are also accompanied by the mysterious word "Vacuum", as discussed on my page about the Taubert compant in the section Taubert, Manufacture Vacuum.